In 2008, we organized a big animal liberation in Mexico City. We liberated more than one million animals including all of the worms. On the same day of the liberation, during the morning, Geshe Gelek, Ven. Dawa, three Mexican students and myself went to the Sonora’s market in Mexico City, where you can get almost any animal you would like. We mostly got animals that were in very bad condition, as well as crickets, fish and doves. The santeros buy the doves to kill them in rituals of Santería, a practice that merges the worship of deities practiced mostly in Cuba but now has spread to other parts of world. At that time, I saw a santero buying a goat, to kill her in a rite of Santería. I approached him and ask him if I could put a blessing cord on the goat, but he replied that he couldn’t because it could affect the energy and so on. I asked him why he was going to kill the goat. He answered that it was because a person needs to expel some bad energy, and this is a method that we use. I tried to explain a bit about karma, telling him that in the long term, maybe killing another being, because it is a negative action, can’t produce a good result. He was open to listen to what I said. When I noticed that he was still going to take the goat, I told him that I was going to pray that he could find another job soon. 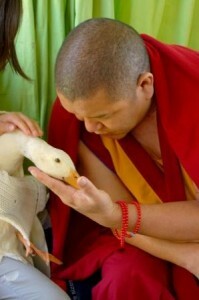 When I was walking back after talking with the santero, I saw Geshe Gelek in front of some ducks. Geshe-la really wanted to buy them, but they were expensive because they were “ducks for ornament,” as people have them in their gardens as a nice “decoration.” With the money it costs for a few ducks, we could get many doves. But Geshe-la insisted that Ven. Dawa and I should get them because they were in very small cages and were in “terrible conditions.” We managed to get four of them with a good discount. When they were free, they were extremely happy and so were we. In the last big animal liberation we organized, even a Catholic priest sent a donation inspired by Lama Zopa Rinpoche’s advice for him to liberate 60,000 animals. Lambs 14, goats 8, big fish 100, small fish 80,898, quail 4, cockroaches 105, beatles 220, chickens 10, geese 4, cats 22, 1 gull, sparrows 130, crickets 35,069, ants 420, iguanas 4, other insects 35, lobsters 10, fly larvae 1,200, other larvae 19,296, butterflies 40, pigeons 528, zenzontle bird 1, ducks 47, middle fish, parrots 4, dogs 4, frogs 620, mice 42, grasshoppers 160, toads 35, tenebrios worms 13,000, birds 5, turtles 3, zophobos 950,1 fox. TOTAL: 153,068 sentient beings freed in Mexico! Plus hundreds of thousands of small worms bringing the total to well over 1 million.